Mediation , a form of dispute resolution, with a civil mediator can be an extremely effective—and proven way—to resolve any type of civil dispute—big or small. During mediation, both parties meet with an experienced and impartial mediator (often former or current Judges) to attempt to reach a mutually acceptable settlement. Unlike a Judge in court, a mediator cannot force any settlement or force action by any party. However, a mediator will give both sides an honest and impartial view of the dispute. 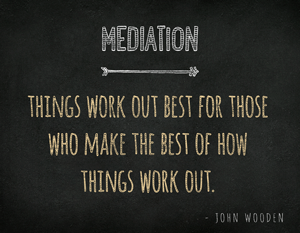 Mediation can be agreed to at the outset of any relationship, by way of a contract between the parties. But the parties can agree to mediate their dispute at any point in time, even after a lawsuit has been filed. Mediation is generally less expensive when compared to litigation in court and can also be a quicker way to resolve a dispute—sometimes hours or several days (rather than months or years). With this form of alternative dispute resolution, both parties walk out of the dispute feeling generally more satisfied having been a part of the negotiation, rather than leaving the decision to a judge or jury. It also gives the parties more control of the outcome and can even help to preserve the parties’ relationship after coming to an agreement. Feel free to contact our Chicago law firm to discuss whether or not mediation is an option for you to attempt to resolve your dispute.